Click on each title to go to the site you want! Storybird lets you use an artist's artwork to create stories. Use the art to write about a book! Have fun! Make a movie about the book you read. You could use any of these movie makers: Windows Movie Maker, Photo Story, or I Movie. You could collaborate with a friend and do an interview with a character, act out a memorable scene from the book, or create a book trailer. Burn a CD/DVD or upload to You Tube. Share your work! 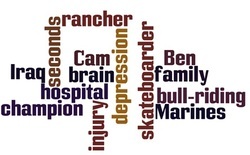 Wordle is a site that create "word clouds." You put it in words, choose the font and color, and create. You could do several "Wordles" for your book, maybe one for every chapter. It is all up to you! Turn your photos, video clips, and music into masterpieces to share with everyone. Fast, free, and shockingly easy. This is an example that Mrs. Martin made for Book Club. You can do it, too! Record your voice or use a voice provided to make a recording. Create trading cards for the characters in the book. Create a comic based on your readings. Create a CD/DVD Cover for your reading material. Create a book cover for your reading material. Create a mini-avatar and write what you want to record. Really cool! Use Voice Thread to record your response. You can even ask some friends to participate and make this a group project. Simply put, Glog is a kind of poster - fully designed by yourself! Glog is a fancy creation from text, images, music and video. Your Glog will stand out. It gives you a perfect tool to express yourself. Write a resume for one of the main characters in your book. Go to the resume generator.